Historians have described the famine relief work accomplished along the Volga River during the years 1921-1923 as the most outstanding act of charity ever performed by the Volga Germans living in the United States. The National Convention of the Volga Relief Society held in Portland, Oregon in 1924. This photograph was taken in Irving Park across the street from the Zion Congregational Church on NE 9th and Fremont. Courtesy of Marie Trupp Krieger. The Volga Germans experienced periodic droughts and famines from the time of settlement in 1767 up to the Bolshevik Revolution. The most recent famine had occurred in 1891-1892. Heart wrenching letters written by family and friends in Russia arrived in Portland in 1891 reporting that horses were being killed for food and children were eating bark to get a little nourishment. Those who could, fled Russia bound for North America. At the time, little could be done in time to help these unfortunate people who were trapped half-way around the world. The next famine would be more severe, and this time, help from Portland and other Volga German settlements in the United States would save many lives. The Russian Povolzhye (Volga region) famine of 1921 began early that year and its impact was felt in through 1924. It is estimated that this famine claimed the lives of 5 million people. The famine stemmed from both natural and human causes. The American Relief Administration (ARA), which Herbert Hoover had formed to assist those who were starving as a result of of World War I and the Russian Civil War, had offered assistance to Vladimir Lenin in 1919. Lenin refused this offer as interference in Russian internal affairs. The growing famine in 1921 and other political pressures convinced Lenin to reverse his policy. He decreed a New Economic Policy on March 15, 1921 which belatedly allowed relief organizations to bring aid. George Repp (owner of a local grocery and meat market), along with his brother-in-law John W. Miller (a local businessman), took the initiative to organize the Volga Relief Society. Their first step, before talking with the Volga German community, was to contact the ARA in New York. The response from the ARA was positive and Repp and Miller soon began their outreach to the Portland community. The enthusiastic response of the Portland people to the news that an organization had been perfected was far greater than anyone could have believed possible. Throughout the following days the newly elected leaders were constantly being stopped by Volga German men and women who expressed their happiness in the creation of the society. In view of the seriousness of the crisis that existed in Russia, all religious and personal differences were forgotten, and people of all denominations and from all colonies showed a spirit of harmony and cooperation that was to remain truly remarkable. The future success of the Volga Relief Society can be explained to a great extent by the splendid loyalty of its members, which became an example for Volga Germans in many other communities of the States. 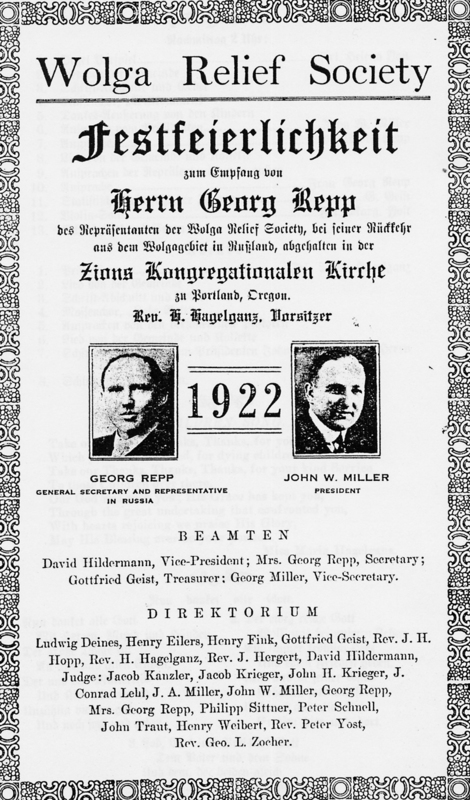 Program for the 1922 Volga Relief Society meeting in Portland at the Zion Congregational Church led by Rev. Heinrich Hagelganz. Courtesy of Marie Trupp Krieger. The Volga Relief Society did immeasurable good in the German colonies by feeding 60,000 adults and 75,000 children, and by distributing medicine, shoes, and warm clothing. The secretaries of the various relief societies state that approximately one half million dollars was raised by Volga Germans living in the United States and sent to their friends and families either through general funds or by means of food drafts and clothing draft. Patenaude, Bertrand M. The Big Show in Bololand: The American Relief Expedition to Soviet Russia in the Famine of 1921. Stanford, CA: Stanford UP, 2002. Print. A personal scrapbook of the George Repp family which includes newspaper clippings, letters, and memorabilia which formed the basis of the research done by Emma Schwabenland Haynes in her book "A History of the Volga Relief Society" is held by the American Historical Society of Germans from Russia in Lincoln, Nebraska. Included are letters from President Herbert Hoover and his cabinet members who helped expedite the work of the society. The collection was in the possession of the Adam Repp family, the brother of George. Jean Repp Piennett and her brother, Earl Repp, donated the valuable materials to AHSGR. Emma Schwabenland Haynes was a niece to George Repp. Emma's mother and Mrs. George Repp (Kate) were twin sisters.